Today was picture day at dance which now means I have absolutely NO patience left... none zip zero. We came home from school washed hair, dryed it (two of the things she hates most inlife... well beside dogs) always a struggle... then we put make up on. In case you are wondering I now know why 4 year olds don't wear make up every day... let see it is because they cry after mascara has been applied, they can't look up or down, the can't pucker their lips nor lick them without looking like a clown in the end, i could go on but i want. You get the point. Then we rolled her hair... you might have thought i was pulling every hair out one by one if you were anywhere in a 90 mile radius of our house but no just simply rolling it... and i did her make up before her hair b/c why??? So we re-do make-up. Take hair down and fix it... and now we are off to the studio... playing quite mouse all the way b/c my nerves were shot I needed a minute to regroup. We get to the studio with little necked girls running everywhere, getting dressed, waiting in line for pictures, running wild and "messing" everything their poor mommys worked hours on fixing, re-do, re-fix. When it was our turn camera dude pays brylee a quarter to smile pretty and not fake... it worked... then more waiting for group picture... for those of you who try to take picture of your 2 or 3 kids and loose your mind... try 15 little 4 year olds... not easy... now costume change, re-do, re-fix, more lines, more waiting, more running, more wildness, another quarter for a pretty smile... and we are done... shooo! Are you tired from reading this? But was is all worth it... absolutely!!! Her pictures were beautiful and you can actually view them on this website http://snapsbylinda.zenfolio.com/f745564575 Friday if you would like. 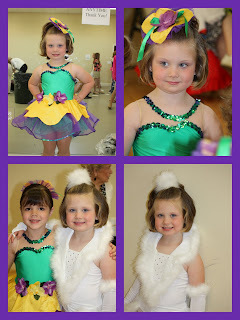 Click on Thursday Dance South Class and scroll through until you see the most beautiful girl . She looks precious, I love the white! How do you get your collages to look so good? I can never get me pictures to be the same size?? ?